Good news for advisors, millennials investing at a much younger age than their parents, allowing them to accrue assets earlier. The bad news, they are also highly likely to manage their own portfolios, a new study shows. About half of "Generation Y" has already started to manage their own portfolios. 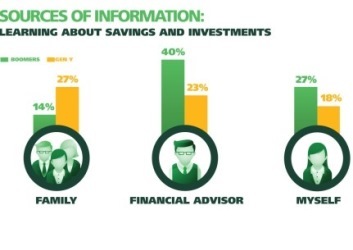 According to the TD Investor Insight Index, 48% of Gen Y investors manage their portfolios directly online and more than one third (35%) said knowing where to get trustworthy advice is a challenge. Although Boomers have the money for his firm's fee-based services, Lamontagne said they have already been considering new ways of business to approach the younger cohort. Alfred Chung, director of TD Direct Investing, the bank's on-line investment proposition, said the younger generation are far more comfortable with self-managing their investments on-line. "Today's young investors are savvy when it comes to building and managing their portfolios," said Chung. "With mobile technology… those who embrace the self-managed investing approach can retrieve real-time stock quotes, access markets and research, and place real-time trades from their smartphone."